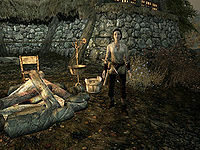 Make a delivery for Sylgja to Darkwater Crossing. Sylgja needs a delivery made. Talk to Sylgja in Shor's Stone. Talk to her father, Verner. Return to Sylgja to receive your reward. Sylgja's parents work in the mine. 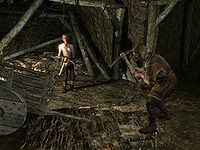 In Shor's Stone you will come across Sylgja, who tells you that her parents live in Darkwater Crossing and asks if you will deliver a satchel of letters to her father there. She would take them herself, but she recently suffered a leg injury in the local mine. Agree to deliver the letters for her, and she gives you her satchel. Travel to Darkwater Crossing and find Sylgja's father, Verner Rock-Chucker, who will usually be hard at work in Goldenrock Mine or resting in his house nearby. Verner is pleased with the letters and asks you to deliver a satchel in return, and suggests that Sylgia will be happy to compensate you for your efforts. Return to Shor's Stone and give Sylgja the satchel from her father. Thanking you for your efforts, she rewards you with a random piece of jewelry. After completing this quest you will be able to marry Sylgja. On the PC, it is possible to use the console to advance through the quest by entering setstage FreeformShorsStone02 stage, where stage is the number of the stage you wish to complete. It is not possible to un-complete (i.e. go back) quest stages, but it is possible to clear all stages of the quest using resetquest FreeformShorsStone02. This page was last modified on 24 January 2017, at 06:41.